To best understand your surgery, it is important to know about your spine. The spinal column surrounds and protects your spinal cord. Your spinal column is made up of 24 vertebrae (bones), plus the sacrum and the tailbone (coccyx). Each vertebra is separated by shock-absorbing discs. These discs give your spine flexibility to move and bend. Nerves branch out from your spinal cord and pass through openings in these vertebrae to other parts of your body. The goal of cervical spine surgery is to relieve pain, numbness, tingling and weakness, restore nerve function and stop or prevent abnormal motion in the spine. Your surgeon does this by removing a disc or a bone and fusing the vertebrae together with a bone graft either in front of or behind the spine. The bone graft may be one of two types: an autograft (bone taken from your body) or an allograft (bone from a bone bank). Sometimes metal plates, screws or wires are also used to further stabilize the spine. These techniques are called instrumentation. When the vertebrae have been surgically stabilized, abnormal motion is stopped and function is restored to the spinal nerves. What are the Reasons for Cervical Spine Surgery? In degenerative disease the discs or cushion pads between your vertebrae shrink, causing wearing of the disc, which may lead to herniation. You may also have arthritic areas in your spine. This degeneration can cause pain, numbness, tingling and weakness from the pressure on the spinal nerves. 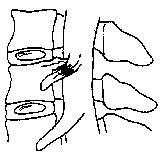 Herniation of disc material results in nerve root pressure and irritation. 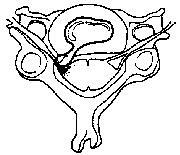 Stenosis limits room in the foramen creating nerve root and spinal cord pressure. Since the neck is so flexible it is vulnerable to injury. Some injuries can cause a fracture and or dislocation of the cervical vertebra. 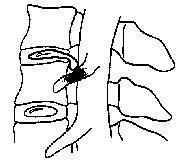 In a severe injury the spinal cord may also be damaged. Patients with a fracture, especially with spinal cord damage, undergo surgery to relieve pressure on the spinal cord and stabilize the spine. What are the Potential Complications of Cervical Spine Surgery? 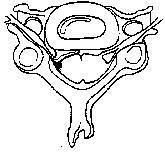 As with any operation, there are risks involved with cervical spine surgery. Possible complications include injury to your spinal cord, nerves, esophagus, carotid artery or vocal cords; non-healing of the bony fusion; failure to improve; instrumentation breakage and/or failure; infection; bone graft site pain. Any of these complications may lead to more surgery. Rare complications include paralysis and possibly death. Your doctor will discuss potential risks with you before asking you to sign a consent form. How is Revision Surgery different? 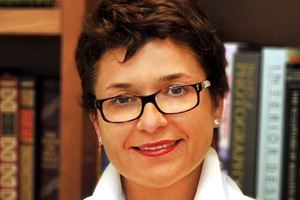 Revision surgery often requires correcting a deformity. The type of revision depends on the type of problem. The procedure may include operating on both the front and back of the neck. The incidence of complications from cervical spine revision surgery is higher than in first-time procedures. It is also more difficult to relieve pain and restore nerve function in revision surgery. Patients should also be aware that the chance of having long-term neck pain is increased with revision surgery.